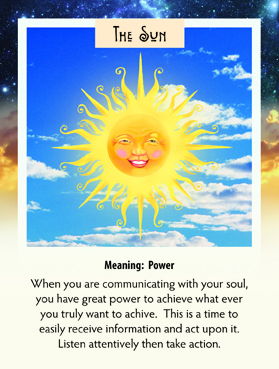 This week we have drawn The Sun card. Ironically, I drew a card on my iPhone on Saturday for my birthday and got the same card! So I hear you Universe! This is a very good card for all of us as it is a reminder that we have excellent communication going on with our soul voice right now! How good is that! We always have that connection of course, but right now we are really able to get our messages and put them into action with ease and grace…with power beyond what our rational minds can sort out. A good and entertaining example is the little kid in the TV commercial that is dressed in a star wars costume going around the house trying to “move” things without touching them with no results. Then his dad comes home and is in the house with a remote control for the car and when the kid, out in the driveway zaps the car, dad uses the remote and makes it come to life! So surprised is the little boy at his own power! The wonderful thing about children is that they expect such things to be possible. As we get older, we stop believing in possibilities. This card is reminding us that it is time to start believing again. Nothing is ever created that isn’t a thought first…so let your thoughts flow and then believe in them as a possibility! Even just a small success is to be enjoyed, and any failures along the way to be forgiven as fast as they happen. That’s how we grow and become the powerful manifestors we are mean to be. Practice, fail, try again, fail, try and try again, and then one day be dazzled by what you CAN make happen if you just get your mind/expectations out of the way.